Don’t Underestimate Regular Visits to Your dentist in Washington D.C. When it comes to protecting your teeth from damage, it relies on preventive care. You brush your teeth twice a day and floss daily to help ward off complications, like tooth decay and gum disease, but is it enough? No. You also need to see your dentist in Washington D.C. twice a year for a cleaning and checkup. Unfortunately, only one-third of adults scheduled an appointment last year, often due to a misunderstanding regarding the importance of regular care. If you do not schedule a visit twice a year, you are allowing preventable issues to damage your smile. Even with the best home oral hygiene habits, it is still not enough to clean all areas in your mouth, like below the gum line. If these areas are not cleaned regularly, it allows tartar and harmful bacteria to accumulate, which can lead to gum disease. With more than 50% of adults having a form of the infection, it is vital that you maintain your semi-annual cleanings to prevent its development. All too often, it is believed that you do not need to visit a dentist until after a problem has arisen, but this is not true. If you do not see your dentist twice a year, you are allowing preventable conditions to develop. This not only damages your oral health, but adds to your long-term cost for care. 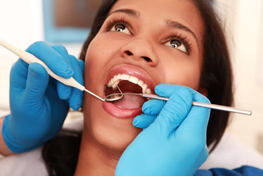 With regular dental checkups, your dentist can monitor your oral health to detect areas of concern sooner. This provides for quick intervention to restore your dental health while reducing the need for a costly or invasive procedure. During your checkup, a visual examination is performed to evaluate the health of your teeth and gums. This also involves probing the gums. While it may just seem like your dentist is poking the tissue, it provides them with valuable insight into your oral and overall health. It measures the depths of the pockets in the gum tissue to evaluate your risk for gum disease. Based on their findings, they may recommend additional treatments, like a deep cleaning. To see areas of your oral health that are not visible to the naked eye, diagnostic images are also taken. This provides your dentist with a full insight into your dental health to ensure that no issues are brewing beneath the surface. Your examination will also include checking the oral cavities for any areas of concern, like lesions, white patches, or other problems that can indicate oral cancer. Your bite and temporomandibular joint will also be checked to look for other issues, like a TMJ disorder or bruxism. If you want your teeth and gums to last for a lifetime, do not miss your next preventive appointment with your dentist. Dr. Yelena Obholz provides comprehensive dental care with a focus on prevention to create healthy, beautiful smiles. If you need of preventive care, contact our office today to schedule an appointment. Comments Off on Don’t Underestimate Regular Visits to Your dentist in Washington D.C.